We have a subscription to this magazine. I love reading it each month! There are tips, activities to do with the kids and more. Here is a completely FREE, no strings attached magazine subscription offer! 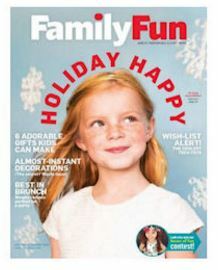 Get a FREE subscription to FamilyFun magazine! Plus, check out some fun ideas the kids can do with old magazines when you’re done with them! If you don’t mind jumping through a couple hoops, you can snag free subscriptions to Family Circle and Outdoor Photographer! Get a FREE subscription to FamilyCircle magazine! For the job questions I just went through and selected “other” on all of them. I declined all the other offers. When you get to the page that asks for Credit Card information that’s JUST if you’re choosing any of the offers on THAT page. We aren’t selecting other offers so just look for the tiny “no thanks” button and click it. Say “no” to a few more offers and you’ll get to the confirmation screen showing that your free FamilyCircle magazines will be on it’s way! Get a FREE subscription to Outdoor Photographer magazine! – just follow the same directions as above.